It’s very funny how some people still go around carrying three or four different modems when they could actually unlock one and use it for different SIM cards. Well, information they say is power, little wonder they say if you are not informed then you are deformed. 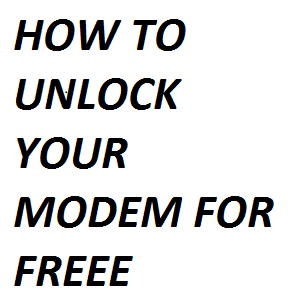 In this write up am going to explain how you can unlock your modem to work on MTN, GLO, AIRTEL, and ETISALAT etc. after unlocking the modem it begins to function as though it’s a universal modem. Unlocking your modem isn’t much of a job but it’s a bit tricky so you have to pay close attention to the steps am about to give out to you. The key factor to unlocking your device is the unlock code, that’s why you are prompted by your modem to insert an unlock code whenever you insert a SIM card other than the SIM the device was meant for. Now note, your modem can be unlocked either with software or by a website that calculates unlock codes for modem. Let’s start by using the software approach. 4. Of course the next thing to do is to install the downloaded software and during the process of installation you will be prompted to type in the IMEI number of your modem. When you correctly supply the IMEI number, the software generates the unlock code, copy this code correctly to your notepad. 5. Next, insert an MTN SIM card if your modem is an airtel modem and you will be asked to supply the unlock code. 6. Supply the unlock code and in a matter of seconds you are good to go. All you need do is creating a new APN for the desired network you wish to browse with. This method is actually new and very few tech bloggers are aware of it. You really do not need your PC to generate unlock code for your modem when using this method. But remember you still need your IMEI number as it is very important during this process. 1. As I have told you in step (1) above, check for your modem’s model and IMEI number. 2. Follow any of this links. For HUAWEI modem and ZTE modem. You will see a space for you to fill in your IMEI, after filling this in click on calculate. 3. Now after your unlock code has been generated repeat steps (5) to step (6) above. After the above steps, your modem has been converted to a universal modem that works on any device. All you need do is create a new APN profile whenever you change your SIM card. I know you have learnt something new, please show your appreciation by sharing to your friends on social media.